Fans of the freeware platformer series A Game With a Kitty will now have a good reason to try a different genre, specifically the adventure game. Author Bernie decided that after wrapping up the trilogy with A Game With a Kitty 3, it was time for a change of perspective. 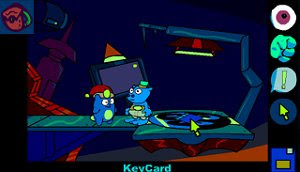 And so this A Game With a Kitty Adventures spin-off is now controlled with a point and click interface, offering two main characters – Kitty and Herbert the Hippo. There’s humor, cute colored visuals, plenty of nonsense and evil to be stopped. It’s a very short game but completely worthwhile for fans of the genre.